Interstellar Spaceflight: Is It Possible? With current space travel limited to just a few robotic probes visiting nearby planets, how realistic is it to think about reaching the nearest stars? For the short term, not very – especially when we speak of manned missions. But the long term - 50 or even 100 years - chances are good mankind will have missions, unmanned to start with, traveling to stars in our galactic neighborhood. Actually, we already have space craft venturing into interstellar space. Pioneer and Voyager probes, 2 each, have reached the sun’s escape velocity and are now forever outward bound. The fastest, Voyager 1, is traveling at 62,000 kilometers per hour (39,000 mph). Even at that tremendous speed it’s painfully slow when interstellar distances are involved. Voyager 1 would take over 17,000 years to get Proxima Centuari, our nearest neighbor at 4.22 light years distance. With a theoretical speed limit imposed by Einstein's Theory of Relativity at 1,079,252,848.8 km/h, or the speed of light, even the closest stars are very far away indeed. But if you take in to consideration the rapid pace of technological advancement, things look brighter. The Wright brothers’ first feeble flights advanced to a man on the moon in just 50 years. In less than 100 years, we can travel 1,000 times faster. If this rule holds true for the next hundred years, we will be able to travel to the nearest stars with relative ease. Predicting this future, however, is not easy. We simply lack even the basic theories to travel at above light speed making the engineering of an interstellar drive even further away. There are however, some interesting ideas on the drawing board that are within current theoretical limits. A study by NASA in 1998 identified 3 potential propulsion technologies that might enable exploration beyond our solar system. 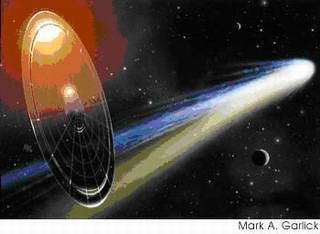 Antimatter, fusion and light sails. Light sails currently are the most technologically viable of the three. Robert L. Forward, scientist and science fiction writer first proposed them in 1984. The basic idea is to use huge lasers to push an object out of the solar system. Although it sounds strange to think of light pushing an object, photons do exert a very small force over objects they hit. Since the force it small, the object needs to be both large and lightweight – like a sail. It also needs to be reflective as only photons bouncing off an object impart velocity – absorbed photons generate heat. To prevent the heat from building up, the backside of the sail needs to be an effective radiator. Because photons exert a tiny force even over a large area, the sail must be large indeed. However, since space is virtually empty, there is very little drag. This means any imparted velocity is incremental – a tiny push over a long period equals one big push. The sail material could be some form of Mylar – both thin and strong. Steering the sail and aiming the huge lasers, however, are not trivial problems. By huge lasers, think 10 gigawatts shining on a 1 kilometer in diameter sail just to send a 16 gram payload to the closest star. The laser must be precisely aimed on target for as long as possible to get the desired velocities. According to its inventor, this light-powered ship could make it to the next star in only ten years. This technology also scales up to allow for larger payloads but laser power levels quickly become gargantuan. To send a 1,000 ton ship with a crew to the same destination would require a 1,000 kilometer sail driven by a 10 million gigawatt laser - ten thousand times more than the power used on all the Earth today. These sails have been tested: On August 9, 2004 Japanese ISAS successfully deployed two prototype solar sails in low Earth orbit. A clover type sail was deployed at 122 km altitude and a fan type sail was deployed at 169 km altitude. Both sails used 7.5 micrometer thick film. They used the force of the sun’s photons as propulsion rather than a large laser. Faster speed could be achieved by fusion motors. Unfortunately, unlike light sails, fusion has yet to be sufficiently well understood to use as a propulsion device. Not for want of billions of dollars in funding to study it, however. Someday soon we may have the ability to control the same reaction that drives our sun. Fusion liberates tremendous energy from a given mass making it ideal for long voyages when fuel weight becomes the critical factor. One interesting idea is the Bussard ramjet first proposed in 1960 by the American physicist RW Bussard. Rather than bring fuel, why not get it from space? Although commonly perceived to be empty, interstellar space has a minuscule amount of hydrogen gas - at a density of about one or two atoms per cubic centimeter. Bussard’s idea is to scoop this gas up using electromagnetic force fields that extend outwards in front of the spacecraft. This field would need to be absolutely gigantic – upwards of 50,000 kilometers in diameter. Shipboard superconducting coils would steer interstellar gas towards the ship compressing it until the density was enough to produce usable fuel. In order to start this collection process the ship would already need substantial velocity – on the order of 3 to 4% light speed. A Bussard ramjet could conceivably achieve a constant 1g acceleration that would allow the pilot to make very long journeys. To an Earthbound observer, such a ship would take hundreds of thousands of years to reach the center of the galaxy. But because of relativistic time dilation, only 20 years would pass for the crew on the ship. Imagine – just 20 years to the center of the galaxy! Of course, technical problems remain such as force field drag, shielding the crew from interstellar radiation and the ability to control fusion reactions. Even farther off technically is the antimatter drive. When matter and antimatter come in to proximity, they annihilate each other releasing even more energy than fusion. A fusion based propulsion unit could generate 100 trillion joules per kilo of fuel – respectable when considering that it would be 10 million times more efficient than chemical rockets. Matter-antimatter reactions, however, dwarf all other reactions. Imagine a drive could generate 20 quadrillion joules per kilo of reaction mass. That’s enough power form one kilo to supply the world’s needs for about 25 minutes. 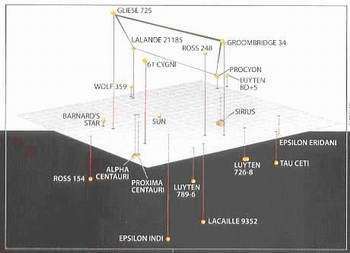 Technical problems include lack of fuel – the world supply is a few dozen nanograms a year, fuel handling – you can easily predict the catastrophic results of an antimatter fuel accident - and reaction control. All these technologies are as far away now as the atomic bomb was to Alfred Nobel – the inventor of TNT. That is to say, not very. We may see the beginnings of an interstellar spaceflight program before the end of the millennium. We will simply need a compelling reason. To contemplate seriously reaching the nearest stars, we need to understand the hurdles involved. First, there is the enormous cost involved in deploying any of the understood technologies. Second, despite UFO enthusiast’s beliefs, there is no hard evidence that we have ever been visited by alien spacefarers. Third, we know we can send radio waves to these destinations without problems. With this in mind, it may simply be too expensive and technically difficult to travel in interstellar space. A better solution has been proposed: why not create an intergalactic Internet? Send small, self-replicating research probes to other stars. Once there, they build copies of themselves and continue to explore outwards, relaying a steady stream of information back to Earth. These self-replicating probes, also known as Von Neumann machines, are named after their inventor, mathematician John Von Neumann (1903-1957). The beauty of this idea is once you manage to construct the first self-replicating machine, the rest is automatic. 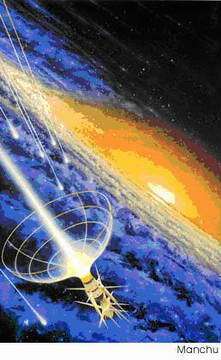 The probes would expand into space geometrically, spreading rapidly to fill the whole galaxy. Once established, this network could be used for communication and localization of new Earthlike planets to colonize. As of now, building machines that work well unassisted remain a problematic task for even the best scientists if recent unmanned mission failures are any indication. A self-repairing and self-replicating robotic probe seems distant indeed. Travel in interstellar space represents a huge challenge to humankind. For now, it remains in the realm of science fiction – but soon, who knows? We may yet live to see the first missions to nearby stars – that is if the last 100 years of history is any guide. Interstellar and Interplanetary travel is possible according to a company that wants to use a linear particle accelerator for propulsion.